Ghost or Odd God! 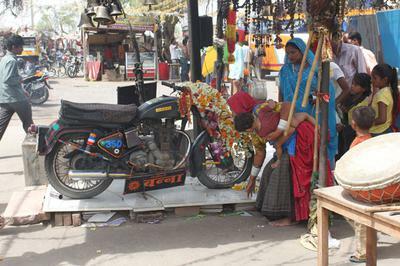 Know why villagers worship Royal Enfield bike in Rajasthan? Mysterious stories, reverence for the supernatural, rituals, deep notions, unshakeable faith in myths… all these and more abound in places of worship in India. But this story is totally different, where villagers in north-western part of India worship a 350 cc Royal Enfield bike. Thousands gather in this Rajasthani shrine situated in a village to pray to a God whose divinity is because of his one-time mount - a 350cc Royal Enfield Bullet bike; and the "incredible" happenings that followed his death due to a road accident. Yes, people gather at this shrine of Om Banna or Bullet Baba in Chotila village of Rajasthan to worship the350 cc Bullet motorbike and his dead owner, Om Singh Rathore. Numerous travellers from far and near throng to NH 65, some 50km-odd from Jodhpur to pray for a safe journey because Bullet Baba is supposed to safeguard the travellers during their journey. Anyone who happens to be in doubt regarding this theory is quickly apprised about the belief , which involves Om Singh Rathore and his mysterious motorbike. spread across the state. It is believed that Om Banna’s spirit helps distressed travelers and fulfills the wishes of the worshippers. 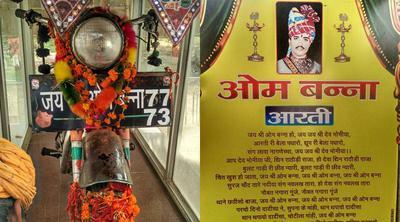 Om Banna, also known as Shri Om Bana or Bullet Banna, this shrine - Bullet Baba Ka Mandir, has three elements. A bust of Om rests on an open and elevated platform with a picture adorning the wall behind. We also find a glass enclosure with a bike at the rear end. This glass case is decked with garlands and tika. A divinely atmosphere pervades here. The tree where Om Banna died is also a part of the shrine. About 100 metres away, stands the jaal tree, with its trunk hidden by the thousands of ceremonial red threads tied around it by devotees. The shrine also has a priest who is taking care of it since the past two decades. The vehicles passing by refrain from honking, as an offering to the 'baba'. What would you offer a mechanical deity? Your first answer would be petrol. But you will be surprised to see people sprinkling alcohol over bullet Baba as an offering, as consumption of alcohol is one of the main reasons for road accidents. Some of the devotees even sprinkle drops of Indian made foreign liquor on the deity in keeping with a tradition seen at many temples in this region, where alcohol and opium are staples of the culture. Devotees feast on a lavish prasad of dal baati, churma, poori, halwa and the ubiquitous liquor and opium.Morning and evening rituals at this strange temple include chanting by priests and beating of a traditional set of drums. The local people also say that every year the motorcycle miraculously starts sometime around the date and time of the occurrence of Om’s death. Since then, the villagers claim that Bullet Baba has put a brake on road accidents in that area and that accidents have been reduced by almost 30 per cent. And for the true Royal Enfield enthusiasts, a visit to “Bullet Baba” is considered no less than a pilgrimage. Apart from a pilgrimage, the temple has also developed the area into a popular tourist destination, as hundreds arrive to witness the following of this mysterious vehicle- A motorcycle revered as a saviour of troubled travellers!